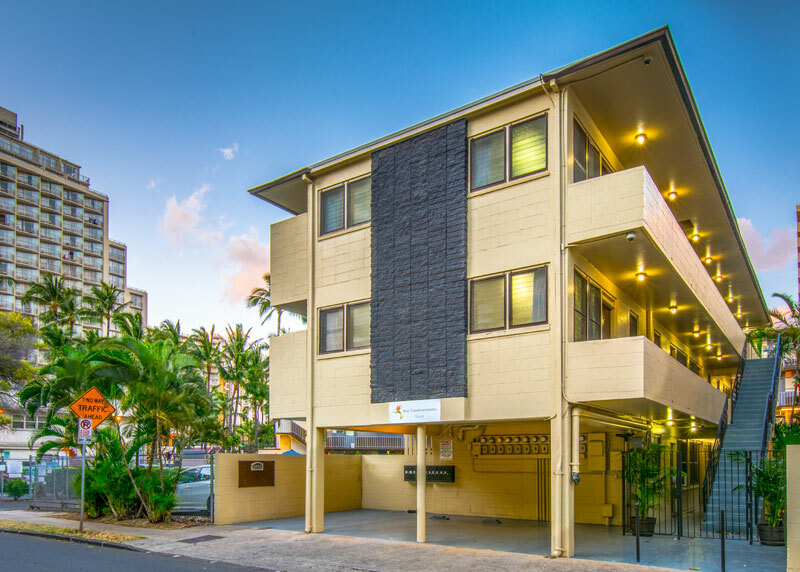 Located in Waikiki, this condo is within a 15-minute walk of Waikiki Beach and Honolulu Zoo. Waikiki Aquarium and Ala Moana Center are also within 2 mi (3 km). A 24-hour business center, self parking, and coffee/tea in the lobby are available at this smoke-free condo. Free WiFi in public areas are also provided. Additionally, dry cleaning, laundry facilities, and a computer station are onsite. All 11 condos have flat-screen TVs with cable channels and feature kitchens with refrigerators, stove tops, and microwaves. Guests will also find free WiFi, balconies or patios, and sofa beds. Limited housekeeping is available. Activities : Known as the “gathering place,” the island of Oahu is the third largest island of the Hawaiian chain. It certainly lives up to its nickname since majority of Hawaii's population resides here and the island is visited by travelers from around the world. Hawaii is also a melting pot of diverse ethnicities evident in the island's culinary traditions, entertainment, art and even languages. Enjoying fun in the sun on Oahu can mean admiring Mother Nature, hanging 10 in the Pacific Ocean or hiking old train tracks on top of a mountain. In no specific order, here are 10 things that travelers should do while on Oahu. Airport : Honolulu International Airport (HNL) is one of the world's largest, busiest and most beautiful airports. Owned and operated by the State of Hawaii Department of Transportation, it covers 4,520 acres of fast and submerged land, and is larger than the major resort destination of Waikiki, which is located 10 miles to the south. Attractions : Pearl Harbor Oahu is proud to feature a number of exciting historic tours to the site of the United States entrance into World War II. Pearl Harbor tours are designed for your convenience and to fit your schedule. All of our tours take you to Pearl Harbor's Visitor Center and the USS Arizona Memorial for a time of reflection and remembrance. The tragic attacks of December 7, 1941 shook the island of Oahu, and the United States, forever. The lives lost, and that tragic day are things that we want to remember and honor. Attractions : After a day at the beach, explore Waikiki by foot, bike or even rented moped. Learn how to strum an ukulele or dance the hula at the Royal Hawaiian Center . Picnic with the family in Kapiolani Park then visit the Honolulu Zoo across the street. There are endless Waikiki attractions to explore. Or venture beyond Waikik i to Pearl Harbor or the North Shore to get the most out of your stay on Oahu. Business : Located within walking distance of Waikiki, the Hawaii Convention Center is like no other in the world. Open to the outdoors – with terraces, lanais, courtyards, waterfalls, and fishponds – this remarkable facility combines the latest in cutting edge technology with authentic Hawaiian ambience. Our cultural diversity and legendary spirit of aloha encourage attendees to see the world in a new light, so it's no surprise that people accomplish more when they meet here. Best of all, the warmth of Hawaii and its people continue to inspire, long after meetings have ended. Dining : The metropolitan center of Hawaii, Oahu has a variety of excellent restaurants to choose from. On Oahu you can eat like a local in small neighborhoods like Kapahulu or Haleiwa or dine in high style at some of Hawaii's finest restaurants in Waikiki and beyond. Downtown : Downtown Honolulu is more than just the state's main business center and financial district. In and around this small jungle of office buildings and bank towers are some of Hawaii's significant and cherished treasures—all within comfortable walking distance of each other. Events : Waikīkī represents a unique conjunction of elements, of dazzling physical beauty, excitement and aloha. Tropical parks and beaches, world renowned hotels, shopping and entertainment, and an ancient island culture delight the millions who visit, work and live here. Golf : Oahu offers challenging and beautiful golf courses from the famous North Shore to the rainforests on the windward side. At last count, Oahu had 37 golf courses. Don't let that number mislead you because eight of them are for military personnel only and nine are private clubs. There are another six courses, like the Ala Wai Golf Course, that are so busy it's almost impossible to get on. That narrows the field to about 16 public and resort courses to choose from. Government : As the “Voice of Business” in Hawaii, the Chamber of Commerce Hawaii is a statewide, non-profit organization whose mission is to serve as the advocate for business in Hawaii. Shopping : Waikiki's experience would not be complete without discovering its style. You can find a wide range of outlets that feature something for everyone. From fine designer boutiques to authentic Hawaiian apparel and souveniers, Waikiki offers the ultimate fashions and designs in Honolulu. In Waikiki you'll find everything from local specialty shops and one-of-a-kind boutiques to popular national retailers and high-end stores. University : Founded in 1907, the University of Hawaiʻi at Mānoa is the flagship campus of the University of Hawaiʻi System. A destination of choice, students and faculty come from across the nation and the world to take advantage of UH Mānoa's unique research opportunities, diverse community, nationally-ranked Division I athletics program, and beautiful landscape. Consistently ranked a “best value” among U.S. colleges and universities, our students get a great education and have a unique multicultural global experience in a Hawaiian place of learning—truly like no place else on earth.